Passive lighting for cyclists refers to reflective and fluorescent surfaces that passively reflect light that comes from elsewhere and so are only for used To Be Seen. In contrast, active lighting means light sources that actively transmit light / are powered and so are so are used To See as well as To Be Seen. For maximum effect, especially in low light conditions and at night, it’s best to use both active and passive lighting when cycling. Although active lighting is far more powerful than passive lighting, passive lighting has some important advantages over active lighting in that passive lighting cannot break or run out of batteries and it’s easier to spread out passive lighting equipment across the bike and rider, which helps drivers to recognize something as being a cyclist. 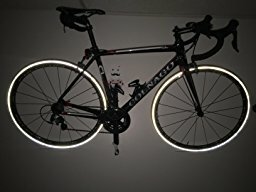 Reflective materials, including plastic reflectors mounted to the bike, reflective stickers on the bike or equipment, and reflective accents on clothing and bags. Fluorescent materials, which are mostly used on clothing and bags. These two types of passive lighting each have different degrees of effectiveness at different times of day. In the table below, a value of 2 means extremely effective, 1 is reasonably effective and 0 is no more effective than a plain white surface. Reflective or more precisely “retroreflective” materials reflect light directly back from where it originated. Reflective materials work best at night when there are very few other sources of light. Just like active lights, ideally only white reflectors should be used on the front of the bike and only red on the back, but as can be seen in the image on the right, some rear bags have white reflective surfaces. Orange reflectors may be used as additional reflectors anywhere on the bike, including the sides. The size of the reflective surface is obviously important, but also rigid plastic reflectors (which consists of micro-prisms that reflect the light) are far brighter for the same size than reflective stickers or clothing accents (which often consist of small beads that reflect the light). Stickers on curved bike tubes or accents on clothing often have an advantage in that they are visible from a wider range of angles than plastic reflectors. Fluorescent materials reflect visible light normally and also transform invisible ultra-violet light into the visible range. They therefore appear to reflect more light than standard materials and appear to glow. During the day-time, fluorescent materials increase the visibility of cyclists (see here). Their effectiveness is greatest in low-light conditions and somewhat diminished in bright sunlight. Many people believe that fluorescent clothing should always be used when cycling at night. In fact, fluorescent colors are no better than other pale colors at night when there are no ultraviolet rays coming from the sun. The size of the fluorescent surface is the most important factor that determines its effectiveness, but color is also important because there are yellow, green, orange and pink fluorescent hues, but yellow has been found to be the most visible. Unfortunately, fluorescent colors fade over time much faster than other colors. Fluorescent materials can be used on clothing, helmets, bags and other equipment. Many perceptual studies in the laboratory and real-world settings have shown that fluorescent clothing improves visibility, especially in low-light conditions. However, research looking at whether wearing fluorescent clothing actually reduces the likelihood of being involved in a collision often finds no evidence for an effect (e.g., see the review in this research article) and there is some evidence pointing towards a counter-intuitive effect in the opposite direction (road.cc). Fire Truck by Darren C.
Yellow, orange and red hues that don’t have any fluorescent properties have been shown to stand out against typical backgrounds better than other colors in the daytime (see here). 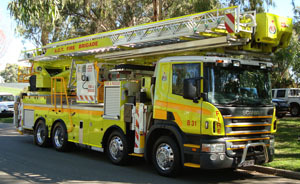 Yellow hues have been shown to be easier to detect in peripheral vision than other colors and they are easier to see in low light than red or other colors, which is why many fire departments are now using yellow vehicles instead of the traditional red. In complete darkness, white reflects more light than any other hue. Phosphorescent materials store energy from light and release it at a later time, so can be used to aid visibility in low-light conditions. However, phosphorescent light is not strong enough to be effective at distance and the effect is only temporary so it is rarely used for road safety. It’s helpful to augment your front and rear Active Lighting with passive lighting that is visible from most angles. This is not only because passive lighting cannot fail but also because it can be dispersed across the bike, equipment and rider so that the larger silhouette shows drivers what the object is and helps them to judge the position, distance, trajectory and speed when it’s dark and there is no ambient light. Where passive lighting is placed is therefore important. Although there is often not much space to mount plastic reflectors on a bikepacking setup with multiple other accessories, reflective stickers placed on the fork legs and seat-stays are normally reasonably visible from a decent range of angles (see the photo in the Reflective Materials section above). Stickers and reflectors can also be mounted to bags, rear racks and rear fenders/mudguards. In a similar way to flashing lights being better at attracting attention than solid lights, illuminating moving parts attracts people’s attention better than illuminating static parts (e.g., see here, here and here). Highlighting the motion pattern also makes it more obvious that the illuminated object is a bicycle. Lighting on moving parts needs to be lightweight and mobile, so this is a good place to use passive instead of active lighting. The feet, ankles, pedals and cranks are the moving parts that are visible from the widest angles. Reflective ankle bands are therefore quite effective, as are the integrated accents on many shoes and shoe covers, although those are often quite small. It’s a good idea to put reflective stickers on the front and back of crank arms. Plastic reflectors on pedals are very effective, but they are not compatible with many pedals that have a clip-in system, which most ultra-distance cyclists prefer to use, but some options do exist. Many “trekking”-style pedals have a flat platform on one side and an SPD mechanism on the other include reflectors (e.g., the Shimano T780 / T8000, Amazon), but I find those pedals to generally only be practical when using different styles of shoes (with or without cleats) on different rides. 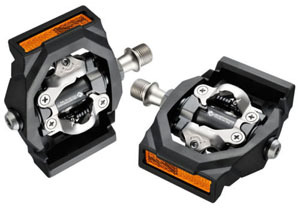 Shimano do make some dual-sided SPD pedals with front and rear reflectors: the Shimano T400 (Amazon) and T700 (Amazon, shown on the right), which are in the easy-entry/exit Click’R range. Since doing the research to write this page and observing how noticeable pedal reflectors are, I’ve started to use the T700 pedals on the bike I frequently use on night rides. Shimano also sells some reflectors that can be added to many of their road pedals, see this list. I rate having reflective materials on the sides of the bike (typically meaning on the tires, rims and spokes) as being far less important than having reflective material that is directed mostly towards the front or rear. Drivers only have a good view of the side of a bike and side reflectors are only lined up properly when a car is approaching directly from the side; in those cases the car will either not be a concern to the cyclist’s safety because it’s too far away and the cyclist will have passed by the time the car arrives or if it’s close enough to collide with the cyclist then the side-mounted reflectors will not be visible until the last moment when it’s already too late. Front and rear visibility are therefore far more important than side visibility for collision avoidance. Despite these caveats, it can’t hurt to be visible from the side. The best method to achieve side visibility is using tires that have reflective strips on the sidewalls (e.g., the Continental GP4000 S II Reflex, Amazon, shown on the right). Such tires are equally as effective as reflectors mounted in the spokes but reflective sidewalls don’t add any weight or disrupt aerodynamics like spoke-mounted reflectors do. Reflective stickers can also be put on the wheel rims. I personally don’t like wearing fluorescent or hi-vis’ clothing and prefer to restrict my passive lighting to my bike and equipment. For me, wearing fluorescent clothing promotes the idea that cycling is a dangerous activity for which special safety equipment must be worn. I don’t like doing this because I believe that cycling is relatively safe (see the Degree of Risk page) and it should be presented as such to encourage more people to cycle, which in the end will make cycling safer for everyone. This article on The Guardian expresses a similar sentiment, and as mentioned above, there is very little evidence that wearing fluorescent clothing makes cyclists safer during the daytime. Instead of wearing fluorescent clothing, I often use fluorescent bike bag covers on my rear rack-top bag or side panniers in low-light conditions. If you are comfortable wearing fluorescent clothing then wearing it on your upper body or lower legs may be another way to get drivers’ attention and make them aware that you’re a cyclist. Many local laws include rules about where and how many reflectors must be mounted to bicycles in addition to active lights. For example, in the UK bikes must be equipped with a rear reflector and front and rear pedal reflectors (see Cycle Law UK). I’m not aware of any laws that currently exist about the use of fluorescent materials. The idea of making high visibility clothing mandatory is often discussed, but currently very few regions have such a law. An argument that often prevents these laws from being made is that there are more pedestrians killed in collisions with vehicles per km traveled than cyclists; in the UK, the numbers are about 25 cyclists killed per billion km cycled vs. 30 pedestrians killed for the same distance walked (although whether comparisons should be made based on a constant distance or another factor is debatable). Therefore, if cyclists were ordered to wear high visibility clothing then the same rules should apply to pedestrians, which would be very difficult to enforce. In some northeastern European countries including Finland, pedestrians are required to wear something reflective at night. In France, cyclists are required to wear a reflective vest when riding in rural regions at night, but not in urban areas; the vest must conform to EN 471 Class 1 or EN1150 and so must have two horizontal bands that are each 5 cm high and a total of 1000 cm2 of reflective material. Using every item of passive lighting is not very practical, so what would be a reasonably sensible and effective setup? Reflective stickers on the fork blades – this increases the size of the illuminated area on the front of the bike to help drivers judge a cyclist’s position on the road, distance away, trajectory and speed. Reflective stickers on the seat stays – as above but for the rear of the bike. Reflective tire sidewalls or stickers on wheel rims – as above but for the sides of the bike. Plastic rear reflector – rear lights can fail without the rider noticing, making a rear reflector even more important than a front reflector. Note that some rear lights have an integrated reflector. Reflective material on the pedals, feet or ankles – nothing is more effective at showing that you are a cyclist than rotating pedals / feet. Fluorescent material in low-light conditions – this could be a bag cover if you are not keen on wearing fluorescent clothing, the effectiveness of which is debateable. This page is in the Rider Safety section. Having covered all aspects of bike lighting on the previous and current pages, Other Safety Equipmentfor cyclists is covered on the next page.